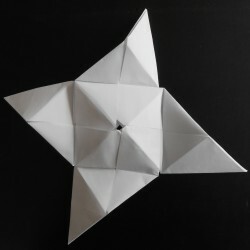 There have been numerous installments of Math Monday on origami or kirigami of one mathematical form or another, but today is the first time we’ve covered a classic workhorse from this genre: The Sonobe modular origami unit. One of the simplest and most versatile of the modular units, there’s so much to say about Sonobe that today we’re going to start from the basics (parallelogram one?) and next time we’ll take it to places I hope you’ve never seen it go before. To make Sonobe units, start with squares of any foldable material you like: office paper, construction paper, grocery bags, aluminum foil, or even (for a much floppier final result) gingham for that matter, and follow the simple instructions found here (provided by H. A. Verrill) to produce a parallelogram with two pockets, just right for tucking in the pointy ends of other parallelograms, as illustrated here. Make a whole bunch of units. 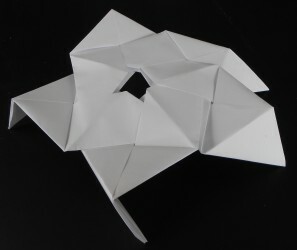 (Hint: Even if it may be origamically unorthodox, for rough exploratory constructions you can fold at least three stacked sheets of paper at a time through the main folds, just separating them for those last small triangle folds and the tuck to produce three finished units.) Once you have a supply of units, start tucking pointy corners into pockets, trying to be semi-systematic, and see what you come up with. Here’s a sort of visual primer of the first set of constructions (put together by Adam Sawicki) that you might encounter in this way. The fewest Sonobe units you can get to close up into something (other than a flat packet) is three, shown at bottom left of the picture. Despite any appearances to the contrary from the photo, this does not yield a tetrahedron, but rather a trigonal bipyramid with all isosceles right triangular faces, each one 1/16th the area of the original square you started with. In fact, all of the faces of all of the models here are those same isosceles right triangles. And the best way to understand their shapes mathematically is to think of them as the elevations of various simpler shapes. What’s an elevation of a polyhedron? 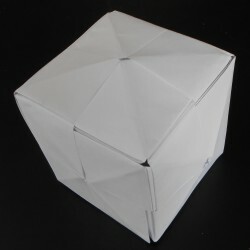 It’s what you get when you add a new vertex in the center of each face and lift each of these vertices up away from the center of the polyhedron, leaving them connected to the surrounding edges. In effect, it glues a pyramid onto each of the faces of the original polyhedron. In the case of Sonobe construction, that’s a pyramid just the right height to be made out of isosceles right triangles. Returning to the picture above, if you’re familiar with the regular octahedron and icosahedron, it’s not too hard to see that the 30-unit construction is an elevated icosahedron and the 12-unit construction is an elevated octahedron. Each elevation has three times as many faces as the underlying polyhedron, but each Sonobe unit contributes two isosceles triangles, which explains why you need one and a half times as many Sonobe units as faces of the original polyhedron. What about the other two constructs? Well, the six-unit construction is an elevation of a regular tetrahedron. What? That’s right, the elevation of a regular tetrahedron with isosceles-right-triangle pyramids is precisely a cube. That principle is in fact the point of the last Math Monday’s installment, in which lopping four of the corners off of a cube of cheese resulted in a regular tetrahedron and four isosceles pyramids. But we digress. What about the three-unit construction? That would have to be the elevation of a two-faced structure — and it is. It’s the elevation of a single equilateral triangle, thought of as having a “front” and “back” face (or “obverse” and “reverse”, if you like) — in other words, a degenerate two-faced polyhedron, in which both faces share the same three edges and have collapsed onto one another. and then continue that pattern (with twelve units in all) around the six faces of a cube. However, the elevation is not very high — in fact, except for a bit of excess from not actually being able to tuck one point truly 100 percent of the way into the next pocket, there’s no real elevation at all, because a point in the center of a square already divides it into four identical isosceles right triangles. And that explains why you can’t really make a dodecahedron out of Sonobe units, as there is just not enough geometrical room to fit five right triangles around a central point. So that should give you enough of an introduction with Sonobe units to start building interesting things. Next time, we’ll see some of the amazing places people have taken them — but in the meantime, if you come up with something cool, send a pic to [email protected] !